Of all the vehicle sets I have, across all themes, this one is my favourite. 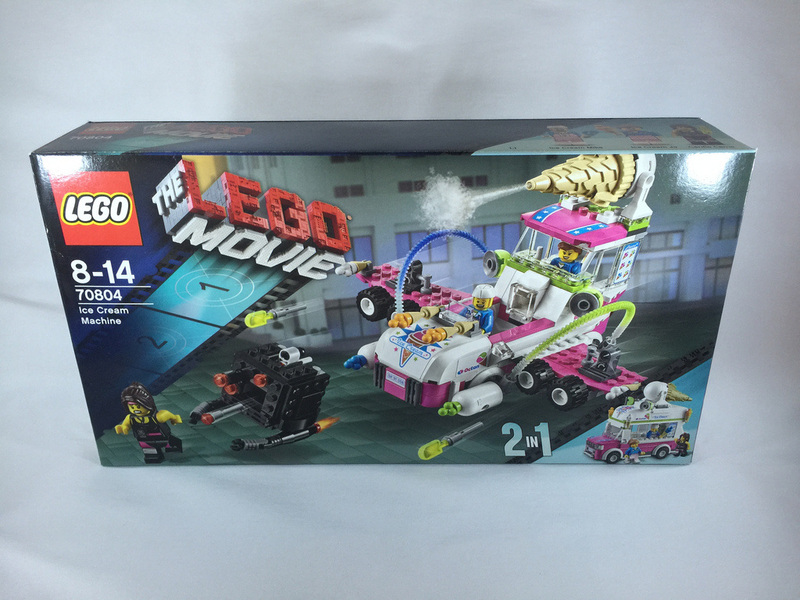 The Ice Cream Machine is one of The LEGO Movie’s 2-in-1 sets. Something normal can be made – an ice cream truck, and something not so normal – an ice cream shooting plane type thing. There’s plenty of pink, and plenty of ice cream to go around! 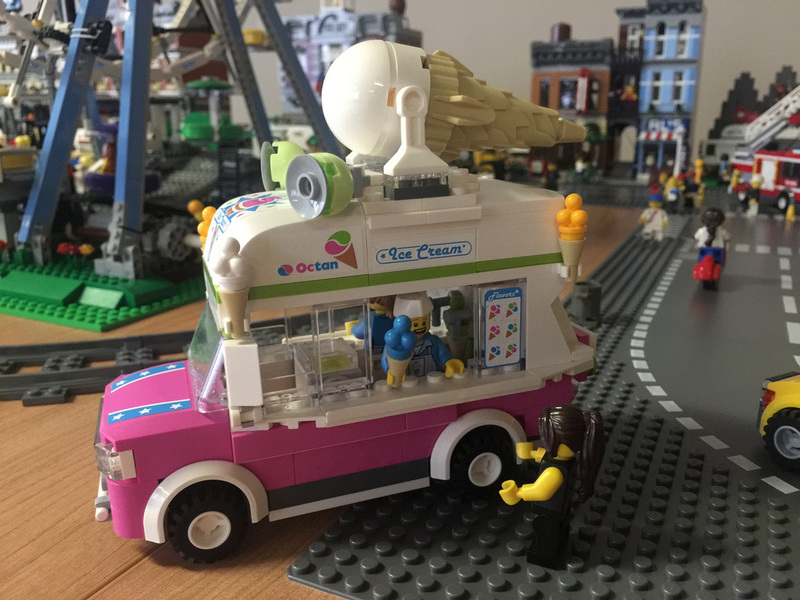 It’s the only ice cream truck that LEGO has produced, and it’s a beauty – a great way to start off the model. 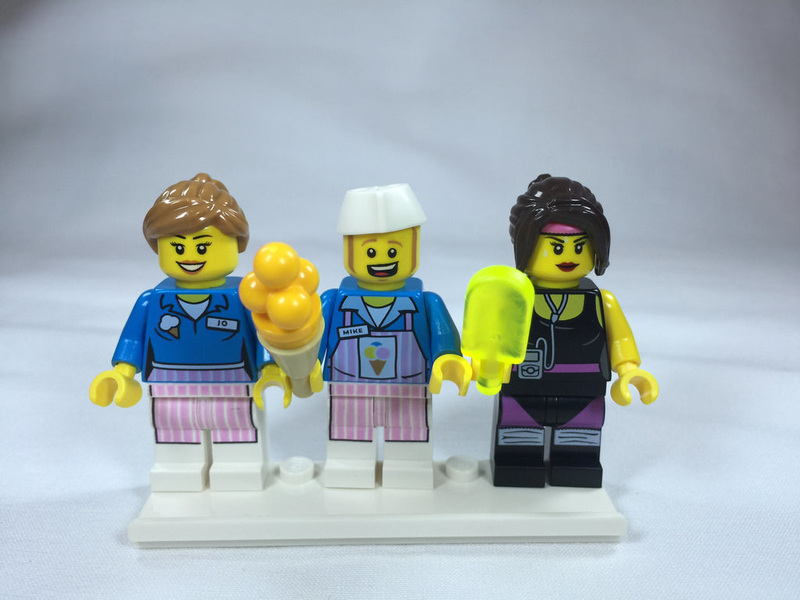 Not only do you get the truck, but three very nice looking minifigures, and a Micro Manager. 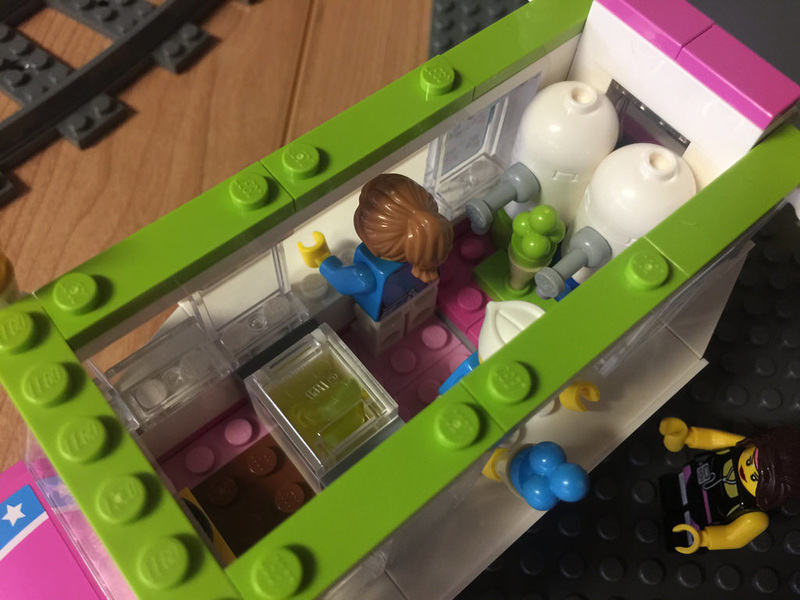 Out of the box you will get six parts bags, one vehicle plate, four hoses (two blue and two green), three instruction booklets and a sticker sheet with eight stickers. 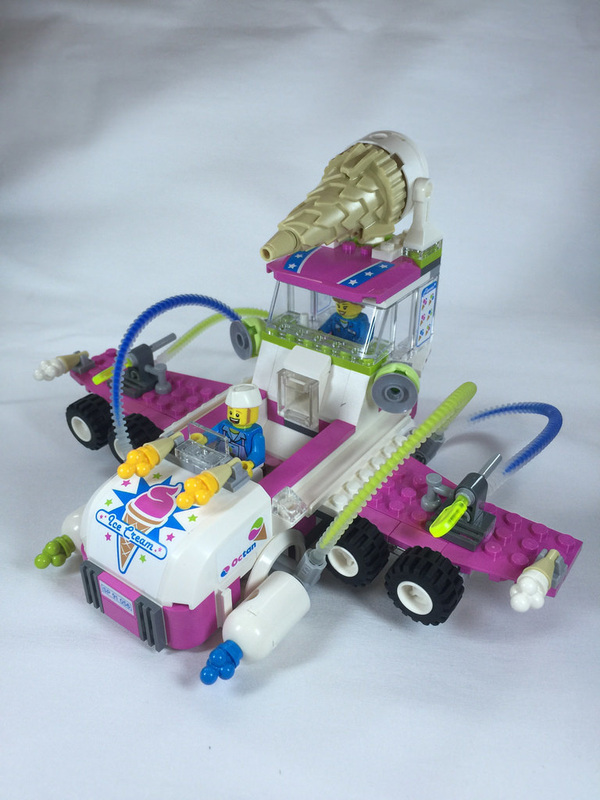 There are some pretty great parts included in this set, many of which are pink. Nothing is a new design (except for the minifigure paper hats and other gear), but a fair few are in new colours. The new pink elements include the left and right 2×4 angle plates, the front 4x6x1 part, and some other basic plates. The cone is also in a new colour, which is originally a drill bit. There are a few others, but there’s a lot more to get stuck into! The minifigures are really great in this set. I’m very happy with them! 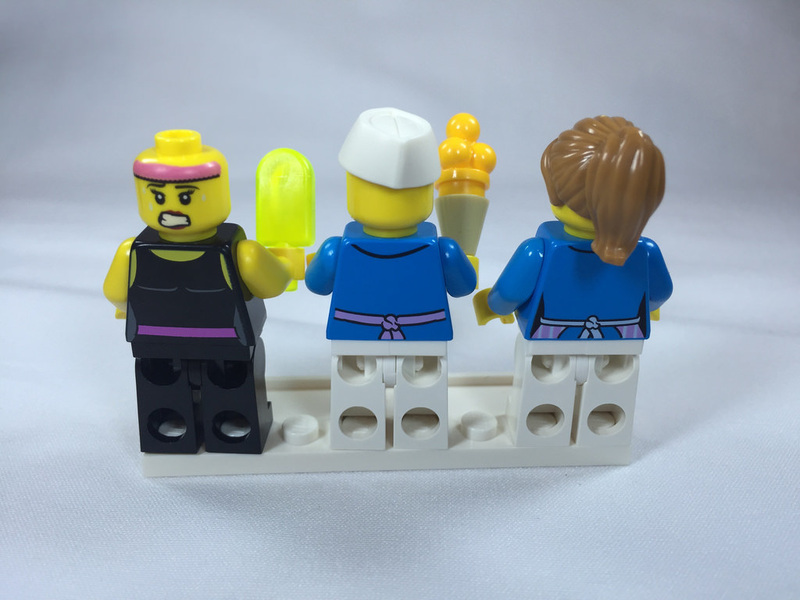 We’ve got Cardio Carrie, Ice Cream Jo and Ice Cream Mike. All three have leg and back printing, and the ice cream vendors even have their names on their shirts. Cardio Carrie also has a reversible head, with what can only be describes as a determined (and slightly sweaty), and scared expression on either side. Unfortunately I did this build in two separate times, and I totally forgot to get a photo of the spares! There are two hoses spare at least – one of each colour. Very generous I thought. The builds are really great. Plenty to look at! 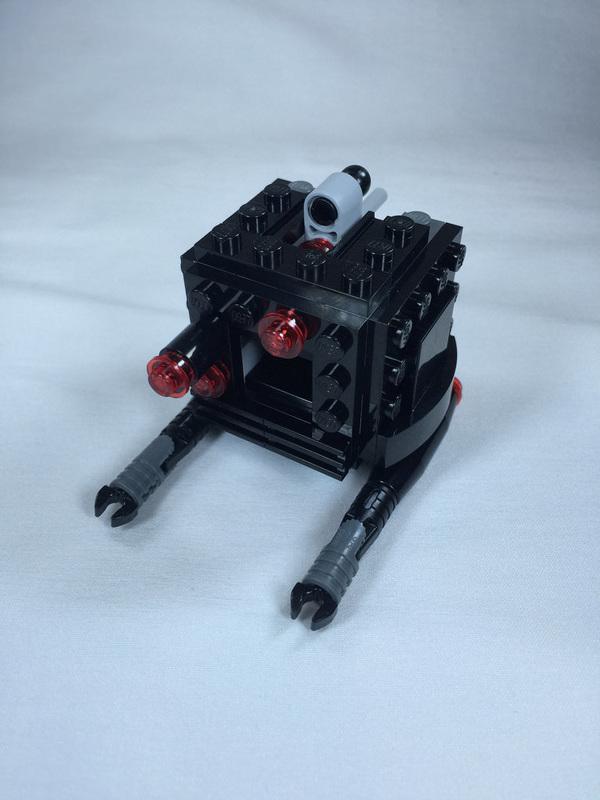 The Micro Manager is pretty basic, with no legs (it’s the flying sort), and a very basic flick-fire missile carrier that for me, didn’t really work very well. It was a little pathetic to be honest, but I did like the mechanism itself. The first model I built was the Ice Cream Machine – the flying version. It was pretty random, but quite good! I like the ice cream cannons, the giant one at the top (the cone), and the fact that it still looks like a truck. It’s bright, colourful, and generally happy looking! It’s very swooshable, and would generate a fair few pew-pew-pew noises. The truck is the highlight for me though. It makes any city scene look alive, and is very reminiscent of the ice cream trucks we have around my neighbourhood. It’s even accessible from either side for all the service! I thought the drill bit as the cone was pure genius It fits really well with the whole look. The view from the back is pretty good, I like that the ice cream cannisters are visible. It also comes with a whole load of ice cream, and a fridge for the popsicles. All in all, it’s bright, cheerful, and whatever model you build, looks great. I’m really excited about this set. It looks brilliant in my city scene. I’d love to get my hands on the garbage truck model (it’s another one of the 2-in-1 sets, but this one keeps me happy for a while. 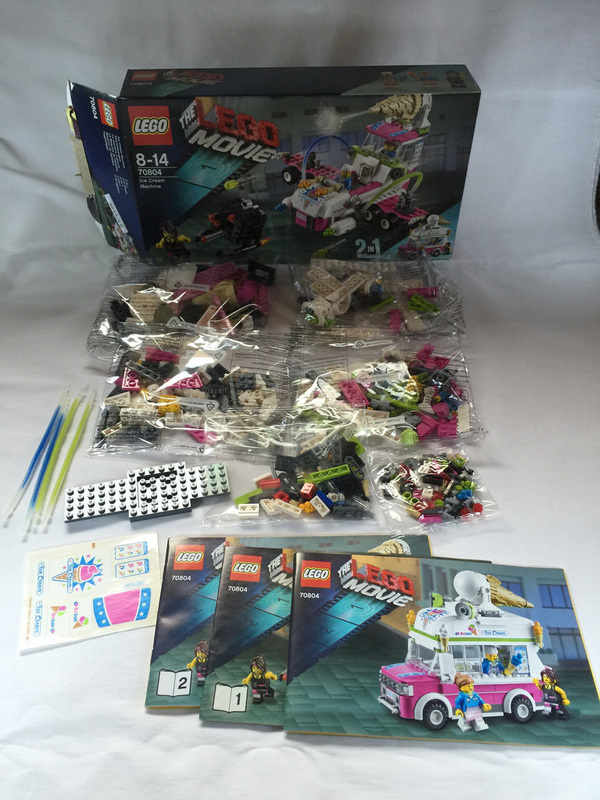 It has plenty of playability, lots of good parts, great minifigures, and is a new set for LEGO, with no ice cream trucks being done before. This set gets 9 out of 10 ice creams. If the flick fire mechanism worked better, and the Micro Manager had legs, I’d be much happier, but it’s a pretty good score! Next week I’ll be reviewing 60050: Train Station. Happy LEGO building!